“Splash of Red” by Kaleigh Wright captures the dramatic beauty of early fall in the crimson leaves of Virginia creeper, a wild native vine that adorns many tree trunks and fences in Westborough. This prize-winning photo was also voted the “People’s Choice” favorite in last fall’s nature photo contest run by the Westborough Community Land Trust. A tinge of purple, splash of red, and patch of orange – autumn comes to Westborough. The early reds are dramatic and special, and one of the earliest is the crimson foliage of Virginia creeper. Look for this wild native woody vine climbing up tree trunks and over fences, heralding the change of seasons with its bright red foliage. The leaves of Virginia creeper (Parthenocissus quinquefolia) are easy to recognize. They have five long leaflets arranged like the fingers on a hand or the spokes of a wheel. Sometimes, though, if a leaflet or two have been lost, it looks as if there are only three or four leaflets. At this time of year, you’re also likely to spot another wild climbing vine with leaves that also turn red, or sometimes orange or yellow – the vine form of poison ivy (Rhus radicans, Rhus toxicodendron). From a distance, it might be hard to tell which vine you’re seeing, but up close, it’s “leaves of three – let it be” for poison ivy. Its leaves have three leaflets, compared with five for Virginia creeper. Poison ivy also commonly grows in other forms, such as a ground cover or a shrubby plant. A tinge of purple in green foliage is probably in a red maple (Acer rubrum) that’s beginning to turn. Eventually its leaves become scarlet. Red maple foliage seems to glow in low, swampy areas, but these trees often lose their leaves early, in a strong wind or heavy rain. A patch of orange in the green foliage probably signals a sugar maple (Acer saccharum). We often associate red foliage with sugar maples, but their fall foliage is more typically multi-colored. You’ll see red, orange, yellow, and green in different parts of the same tree, or even in a single leaf. Virginia creeper, poison ivy, and these maples aren’t the only reds in our landscape. Other notable early red comes from sumacs, such as smooth sumac (Rhus glabra), staghorn sumac (Rhus typhina), and shining or winged sumac (Rhus copallina). There’s also poison sumac (Rhus vernix), but in our area you generally have to go deep into a swamp to find it. Flowering dogwood trees (Cornus florida) and wild dogwood shrubs (Cornus species) also lend red hues to our landscape. Invasive shrubs also contribute red to the woods. They include burning bush (Euonymus alata), also known as winged euonymus, and Japanese barberry (Berberis thunbergii). Eventually, in late fall, some oaks (Quercus species) turn shades of dark red or rusty red. Their leaves also turn brown, so we tend to think of them as brown in autumn. Getting back to Virginia creeper, how does it manage to climb straight up a tree trunk, as seen in Kaleigh Wright’s prize-winning photo? These vines cling tenaciously, as you know if you’ve tried to pull one off something. They grip with tiny, sticky cup-shaped disks on the tips of branching tendrils. A disk forms only when a tip touches a support. The disks are only about 1/8 inch, but they make a very strong glue-like substance that sticks them tightly to tree bark, a fence, or other support. A branching tendril with only five disks can reportedly hold up to 10 pounds of weight. 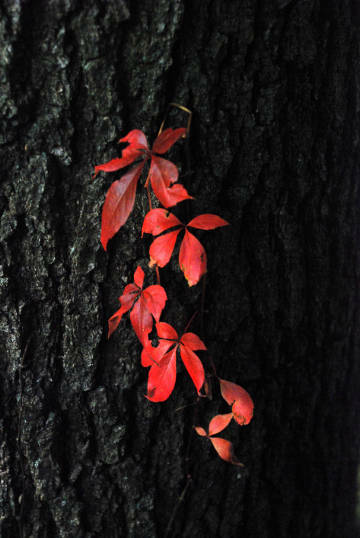 You may have seen another vine that climbs with disks and has red leaves in the fall: Boston ivy (Parthenocissus tricuspidate), a non-native relative of Virginia creeper. Typically it grows up the sides of brick or stone buildings. This vine comes from Asia but was introduced to Boston in the 1860s. Supposedly it’s the ivy on the buildings of Ivy League colleges. As it turns out, all vines don’t climb in this unusual way with adhesive disks. For example, poison ivy vines grow aerial rootlets that grip tree trunks. You may have seen these rootlets on the fuzzy-looking “monkey’s tail” of a thick poison ivy vine growing up a tree in the woods. English ivy (Hedera helix), another non-native ivy seen on buildings, also climbs with aerial rootlets. Grape vines cling and climb with tendrils. So do greenbriers. Bittersweet vines twine around other plants. You may have noticed a thick, woody vine of invasive Oriental bittersweet (Celastrus orbiculatus) wrapped tightly around a tree trunk that has continued to thicken around the vine. Besides its red fall foliage, Virginia creeper bears clusters of small dark blue berries in the fall. They develop from small, greenish flowers that bloom in summer and are pollinated by bees. The vibrant red foliage is believed to signal to birds and other animals that the berries are ripe for eating, so the seeds will be spread. The berries attract many kinds of birds, including robins, bluebirds, mockingbirds, brown thrashers, wood thrushes, red-eyed vireos, and several kinds of woodpecker. Chipmunks, skunks, mice, and red foxes also like the berries. Deer consume the twigs and leaves. The caterpillars of three kinds of sphinx moths also feed on the plant. Like many plants that are toxic to humans, Virginia creeper has had medicinal uses in the past. Native Americans made tea from different parts of the plant to treat different ailments: plant tea for jaundice, root tea for diarrhea or gonorrhea, leaf tea to wash swellings and poison sumac rash, and leaf tea mixed with vinegar to clean wounds. With a name like Virginia creeper, people sometimes think this vine is a non-native invasive plant. But it’s very much a native plant of eastern and central North America, from parts of Canada to Mexico. In fact, Virginia creeper is recommended for gardens as a native alternative to invasive oriental bittersweet by the Brooklyn Botanic Garden. It is fast-growing, does well in sunny spots and tolerates shade, prefers acid soils such as we have in eastern Massachusetts, and is also salt-tolerant. Enjoy spotting Virginia creeper around town each fall, whether it’s in the wild or in a garden.